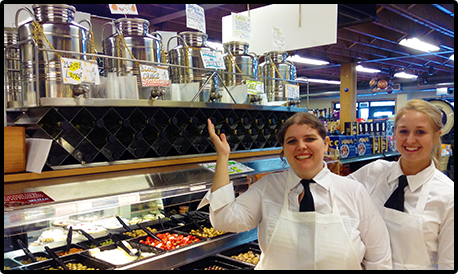 Introducing our new Balsamic and Olive Oil Bar! A good extra virgin olive oil or Modena balsamic vinegar can make any recipe into a stellar dish, and here at Inboden’s, we have a stellar selection to help you find that perfect oil or vinegar to compliment your meal. Located next to our bakery counter, our new bar contains five different flavors of extra virgin olive oil, and five different flavors of balsamic vinegars to help spice up any dish that you prepare. If you need some recipes to go with all our delicious flavors below, just download these .pdfs for some ideas! Tuscan Herd: Infused with rosemary, oregano, basil and garlic, this oil is great for any Italian dish as well as a variety of meats for a great Tuscan taste! Meyer Lemon: A nice citrus zing for fish and chicken. Also great on salads! Blood Orange: This sweet oil is perfect for Asian dishes! Garlic: BIG garlic flavor and goes well with almost anything! Arbequina: A light, buttery olive oil from Spain. Great for everyday cooking or salads. Traditional 20-year Balsamic: Sweet and rich, this vinegar has been aged to PERFECTION! Drizzle on fruit, salads or use as a vegetable marinade. Pomegranate Balsamic: Tart and tangy, it’s great on fresh greens and fruit as well as a glaze for pork. White Grapefruit Balsamic: WOW! This light and refreshing vinegar is perfect for summer salads and fruit mixes. Try it on grilled shrimp or as a reduction over fish! Tangerine Balsamic: A citrus vinegar with zing that pairs well with most meat and fish. Blend with our Blood Orange Oil for a great dressing! Fig Balsamic: This vinegar has a dark, rich flavor that enhances poultry, pork and beef.